Stomach pain from pancreatitis can feel severe, sharp and come on quickly, or it can feel more like a constant, dull discomfort. Either way, you need to address it by working closely with your doctor and by making important lifestyle changes. 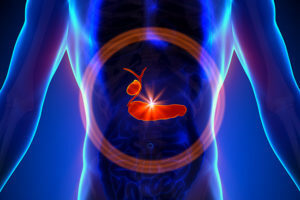 “Early and aggressive treatment of pancreatitis can improve outcomes, prompt an early recovery and limit complications,” says pancreatic specialist Prabhleen Chahal, MD. Pancreatitis occurs when the pancreas — the long organ that sits behind the stomach and next to the small intestine — gets inflamed. 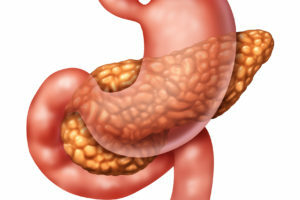 The pancreas aids in digestion and helps regulate hormones for sugar and metabolism. Problems occur when the pancreas releases digestive enzymes too soon and they attack the pancreas itself instead of breaking down the food you eat. Acute cases strike quickly. Symptoms may range from mildly uncomfortable to life-threatening. Mild attacks typically last a few days, Dr. Chahal says. “The disease of the pancreas has significant impact on your quality of life,” she says. “Successful management will involve multi-specialist care, including behavioral and lifestyle modification,” Dr. Chahal says. Recurrent flare-ups of pancreatitis can lead to pancreatic scarring, so it’s crucial to make these needed changes, she says. Gallstones. If you are diagnosed with gallstones and have suffered an attack of pancreatitis, removing the gallbladder can help prevent future problems. Heavy drinking. Excessive alcohol intake causes up to 70 percent of chronic pancreatitis cases, and nearly half of acute pancreatitis, so it makes sense to stop drinking alcohol. Smoking. It can make your outcomes worse, make the disease (chronic pancreatitis) progress faster and increase your risk of pancreatic cancer. Poor diet. Avoid high-fat foods, especially fried foods that can put a load on your digestive system. Instead, focus on eating a low-fat, high-protein diet that is rich in vitamins and nutrients. Patients with chronic pancreatitis often benefit from institution of medium-chain triglyceride (MCT) oil in their diet. You may also consider taking artificial digestive enzymes, which help your body break down food and absorb nutrients and vitamins. If your pancreatitis is causing you mild to moderate pain, over-the-counter pain medications (acetaminophen or ibuprofen) taken over the short term may help. For pain that is constant and severe, you should consider a consultation with pain management doctors who often prescribe medications called neuro pain modulators. A specialized procedure called celiac plexus block is also offered to patients for managing chronic pain related to chronic pancreatitis. If you’ve had an acute attack, you often can help avoid recurrence with behavioral changes and use medication as needed. But in some cases, further endoscopic procedures (Endoscopic Ultrasound, ERCP) or surgery also is necessary. If you have stones in your pancreas, doctors may use shock waves to break up the stones that are creating blockages. This may help with the pain and recurrent pancreas flare ups. Finally, surgeons can remove diseased or inflamed areas of the pancreas (or the entire pancreas, if necessary). Ultimately, Dr. Chahal says, managing the condition often requires both medical, endoscopic, surgical and personal changes.